To clean, or not to clean; that is the question. I recently made the acquaintance of a gentleman in the State of Jefferson that has cleaned antique bottles. And during the course of our conversation, the topic of whether cleaning was an ethical practice came up. What, with all the controversy being stirred up by an individual on the east coast about cleaning, misrepresentation, "criminal acts of the process", ad nauseum; the discussion was inevitable. The concept behind cleaning is simple; a bottle which was once in pristine condition has been buried in soil. The minerals, acids and or alkalis in the soil react with the components in the glass and an exchange takes place whereby the previously bright and sparkly glass becomes opaque at best, or etched at worst. This process has been generically referred to as "opalization" over the years. Simply, the bottle is no longer in it's original state and is unattractive to look at. 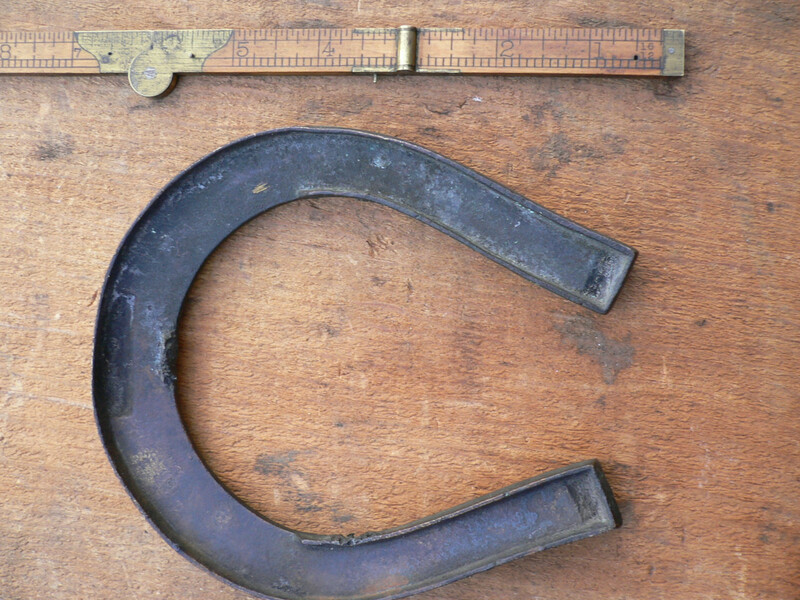 In the old days, (1960's - 1970's) a wet cotton wheel attached to a washing machine motor was used and grits of varying grades were combined to make a slurry which was applied to the cotton wheel. Once this was done, the bottle was ground away on in hopes of removing the stain. This constantly resulted in bottles that had the embossing all but worn off and broken bottles due to excessive friction and heat. Thank God those days are apparently long gone. According to what I was told, the wheel has been reinvented and the process now bears no resemblence to the old style of cleaning. Being of open mind, and having owned numerous rare but badly stained western whiskies over time, I was like a sponge. Modern cleaning merely removes the opalization and restores the glass back to it's original condition. It does not add an additional coating to or alter the basic makeup of the glass. Nor does it grind away glass along with the stain. And that's where I begin to realize that modern bottle cleaning is an attribute and not a detraction to a bottle. Again, it is simply restoring the glass to it's pre- disposal condition. 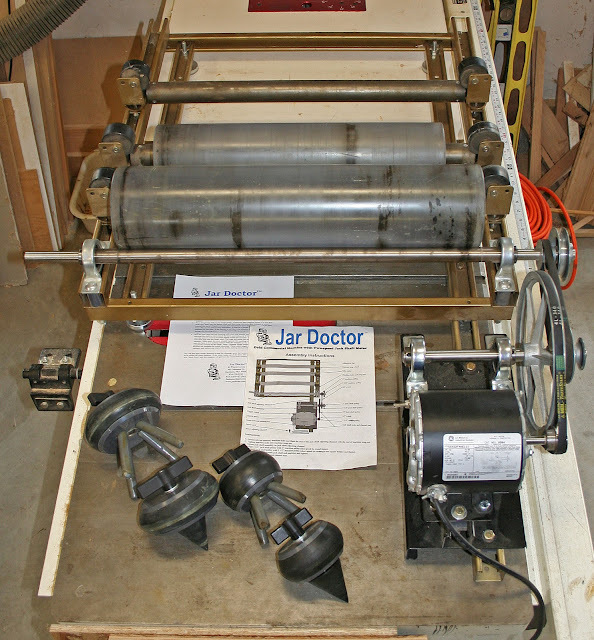 The particular machine used by this person was made and marketed by Mr. Wayne Lowry, also known as the "Jar Doctor". At first glance one can see the quality and attention to detail put into this machine. It features easily adjustable rollers that accomodate different sized cylinders to allow different size and shape bottles to be cleaned. According to what I was told, the process is simple. The base "stopple" has fingers that grip the base of the bottle when it is inserted into the cylinder. The bottle is first loaded with fine pieces of copper wire and powdered oxide. Water is added to the inside of the bottle just above the copper. The bottle is inserted into the cylinder and the mouth plugged temporarily to allow addition of more copper, oxide and water to the inside of the cylinder without adding more to the bottle. Once this is done, a "cone stopple" is inserted into the mouth of the bottle and the cylinder is sealed by use of a compression gasket and wing nut. 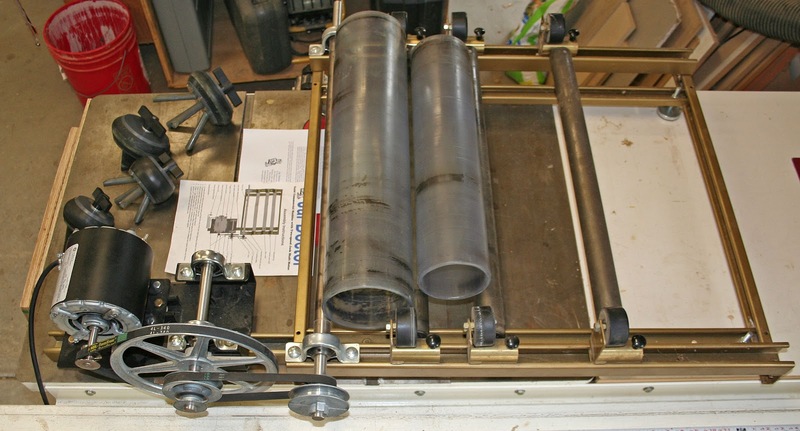 The cylinder goes onto the rollers and a switch gets flipped to begin the process. The cylinder ends get reversed about twice a day in order to change the direction of rotation. This allows the copper and oxide to get into every recess and avoid over cleaning in either direction. After a period of time ranging from one to three days, depending on the amount of stain present and hardness of the glass, the switch is flipped off and the cylinder opened up. The slurry is rinsed off of and out of the bottle using tepid water and the bottle is gone over with a quick rub down of soft scrub outside and ammonia inside to remove any remaining traces of oxide. Assuming that all went according to plan, the "opalization" is gone and the bottle now looks exactly as it did before being tossed out with the garbage, a century or more before. According to this person, he's never broken a bottle. Now, before you decide to run out and buy a machine, be advised that they are expensive. Like any tool, price and quality generally go hand in hand. The particular machine that I was introduced to sells for well over a grand plus shipping. Northern California is famous for good bottles. It's also famous for nasty soil that eats glass. Often bottles, rare or not, are so sick that they are relegated to a box in the shed rather than being placed on a display shelf. I viewed before and after photos of a number of bottles that had been dug and then cleaned. Impressive to say the least. Apparently, the learning curve of modern bottle cleaning is challenging at best. 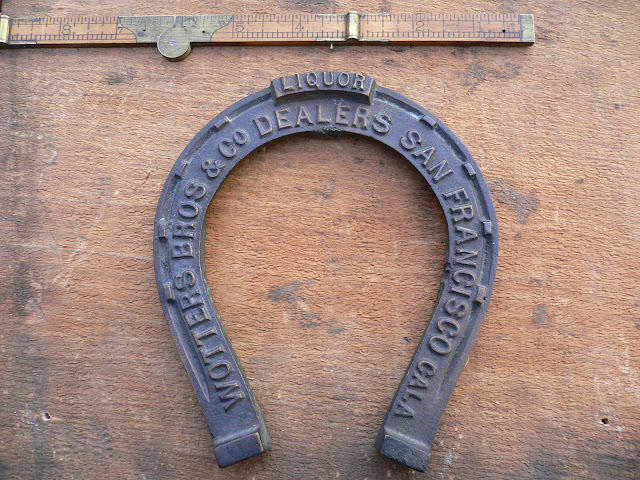 Early black glass from the Gold Rush era of 1850 differs in composition and hardness compared to say a San Francisco whiskey dating from the 1870's or 80's. And, "tap*tap - no erasies" is the rule of the day when you screw up. As such, it's often a good idea from both a cost and risk standpoint to solicit the services of a professional. 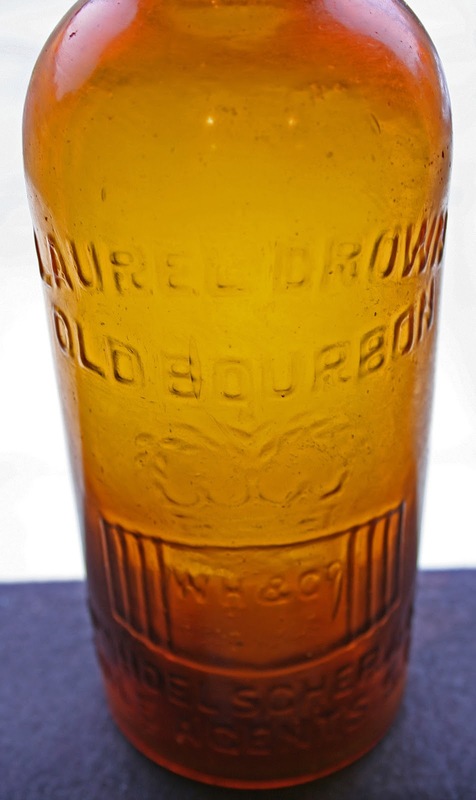 Lou Lambert, and a few others out there have elevated modern bottle cleaning to a science. My hats off to those that have expended the time and energy to perfect bottle cleaning in the 21st century! It does go without saying that once it's time to move a bottle along, the potential buyer must be made aware of the fact that it has been cleaned; that's just common courtesy. The vast majority of the collectors that I associate with would much prefer to own a bottle that has been cleaned compared to one that is so sick that it belongs tucked away in a box. Based on my observations, there is no question in my mind that done properly, bottle cleaning is ethical and does nothing to alter a bottle; it simply restores it 's appearance to pre-disposal condition. Furthermore, it preserves a piece of history that we can all be proud to own instead of having to make excuses for. Thanks to what I've recently learned, I think that it's a travesty to leave a good (but stained) bottle stuffed away when it can be restored to as new appearance and be proudly displayed for all to enjoy. Ebay never ceases to amaze me with the sheer volume of "stuff" that comes to the auction block. Most of it is pretty ho-hum. The quantity of "rare" and or "one of a kind" ten dollar tool top whiskeys listed for $100~ boggles the mind. And yet, once in a blue moon a real rarity appears. I spotted just such a thing this morning while perusing the latest and greatest listings over morning coffee. 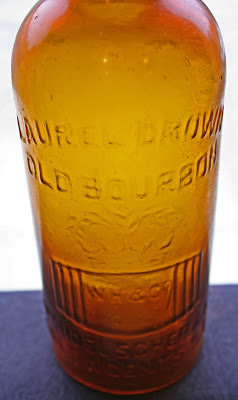 Listed by a seller named "badgerlaunch"; it's actually not a bottle that caught my eye, but a cast iron (or brass or bronze) advertising go-with. It is the first of these I recall seeing or even hearing of! At first glance I thought, how cool; Wolters Bros. was running a scam on Spruance Stanley & Co. by using their horse shoe logo on a saloon giveaway. But a second glance at the picture caused me to do a double take. WoTTers Bros / not Wolters. Huh? That's when the piece really caught my interest. I've never seen any reference to Wolters Bros. without being listed as "Wholesale" liquors; not "liquor dealers". Not on a bottle, not on a shot glass and not on a billhead. 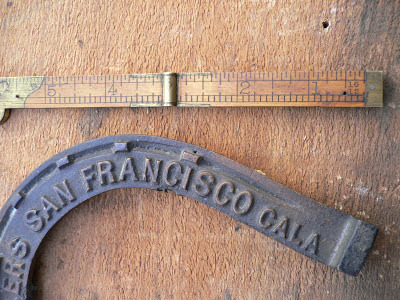 And then the abbreviation for California is cast on the pieces as "Cala"; not "Cal.". A quick stroll through the S.F. 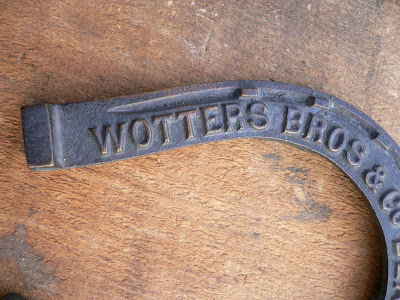 historical newspaper archives shows no recorded entity by the name of Wotters Bros. from 1870 - 1900. Same goes for the city business directories. Ok, so let's assume that it was a typo. Why stop there when you can have a two-fer and really fowl up the order; hence the term "liquor dealers" instead of wholesale liquors? If I recall, Cala was a little used abbreviation of California during the latter part of the 19th century, especially in the southern part of the state. But why go to the bother of adding an extra vowel when you could just as easily cast the letters Ca. or Cal.? This piece has all the ear markings of being the real deal, instead of a modern Chinese or Indian fantasy repro (ie; fake) since it appears to be corroded and bears evidence of having some sort of a faux copper plate at one time that has long since eroded due to burial. My guess is that it was indeed an advertising give away commissioned by Wolters Bros. & Co. in the late 1880's or early 90's and it was rejected due to the myriad of mistakes present. What's your take fellow collectors?